Queen Anne’s Joshua Crites moved to the Seattle area five years ago to work in affordable housing. He is a strategic advisor for the Seattle Housing Authority; he previously did policy work for the Tacoma Housing Authority. Crites will leave on Aug. 2 to move to Germany for 14 months as a fellow in the Alexander Von Humboldt Foundation’s German Chancellor’s Fellowship. The foundation gives out about 50 research and science fellowships each year, to bring up to 10 people each from the United States, Russia, Brazil, China and India to Germany for enrichment. The first two months of the fellowship will be spent in Bonn, doing an intensive German-language training — a language Crites has no experience with. That training will continue over the next 12 months as he spends one month in Berlin for orientation and the remaining 11 months in the city of Hannover to study public housing. The fellows will all be together in the beginning for the language training and orientation, but then many will move on to different host cities. Crites was able to meet the other fellows during the interview process in Bonn. The other fellows’ research is diverse, Crites said, from cancer research to antitrust laws to saving mom-and-pop shops in India. “They’re just some really unique, dynamic people from all around the world,” he said. In July 2015, Crites will also have the chance to have lunch with Chancellor Angela Merkel with the other fellows. 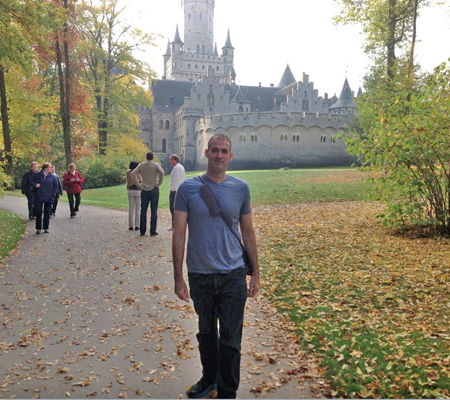 Two years ago, Crites won a three-week fellowship to travel to German cities and learn about urban planning. While there, he made contact with the housing company in Hannover and learned a little bit about how they function. “The way they were doing business, I needed to know more,” Crites said. So he searched until he found the Humboldt Foundation and applied for the fellowship. The interview process was intense, Crites said. He traveled to Bonn, where a panel of Americans and Germans interviewed him. He presented his project idea to the panel, and then, during the second round, he was put into a room with four other American candidates. The group was asked to discuss the National Security Agency and whether they could have security and rights to privacy while they were observed. Crites said he thought the observers were looking for leadership qualities and the ability to keep a conversation on track. The foundation is family-oriented, Crites said, so his wife, Elizabeth will also move to Germany with him. Elizabeth is a writer so she’ll be able to spend her time there continuing her work and focusing on her writing, Crites said. The foundation gives fellows a stipend, which covers living cost and travel, and it helped Crites find a place to live in Hannover. He’ll stay in a furnished apartment that’s usually reserved for visiting professors. Crites will base his research at the city’s social-housing company, particularly how Germany handles its public and affordable housing. The fellows will also spend two weeks at the European Union, where Crites will collaborate with the Housing Europe group. “We’re always looking for ways to compare and contrast the ways we’re doing our work versus others,” Crites said. Crites hopes to learn a few main things while in Germany: how the Germans fund their affordable housing, how they design their programs, how they administer the programs and get people into houses and how they get people on the track to self-sufficiency. Germany isn’t necessarily a leader in affordable housing, but it was Crites’ own personal interest in the country that had him looking to travel there. The rates of homelessness seem to be lower in Germany, and their affordable-housing systems do turn a profit, so Crites is eager to learn how those systems work in comparison to the housing system in the United States, which is “grossly underfunded,” he said. Crites will spend his days looking through archives, meeting with housing and oversight officials and conducting tenant surveys. He’ll also meet with the federal oversight agency in Berlin. Crites plans to write articles and share information upon his return. He’ll also share it with the National Association of Housing and Redevelopment Officials (NAHRO), of which he is a member of its international committee. “I’ve had the chance for five years to work in the affordable-housing industry here in the U.S., and to see how another country as established as Germany does business and to bring that back here in the U.S…to help our families is a huge interest to me,” he said.